In the fall of 2017 I made the decision to close my business "Build Your Tour". Several factors influenced me including state and local taxes and the underlying fees and requirements to keep a 1-person operation going. I followed all the "rules" but with retirement approaching rapidly for us it just doesn't make sense to continue pursuing such an enterprise with enthusiasm - and that's what Build Your Tour required. So I've joined the ranks of America's small businesses that shut down. Count me up in the statistics. After many hours in the training saddle, I'll be happily designing my own books after my personal glorious bicycle tours. 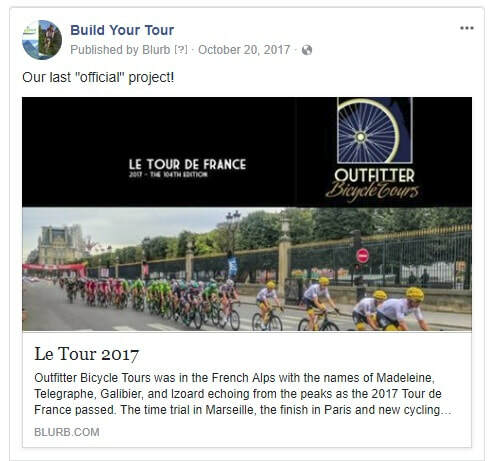 The last official project was completed in the fall for our friends at Outfitter Bicycle Tours. I plan to continue designing books for tours I participate in or for friends. But I'm shutting down the social media sites and online tools as the expense of maintaining them becomes tedious. For example, Build Your Tour's facebook page has seen its demise. I won't be maintaining or updating Twitter or Pinterest or others. This personal blog will be the only place a semblance of the business memories are retained. You may see me at the club, on the road or, virtually, on the online through my other websites (www.valuepharmacists.com & www.denvertechforall.org) But, should you want to kick some ideas around about cycling or photobooks, or ask a question, I'd be happy to e-chat. Send me a message. Just a place to share some thoughts.